Greetings, dear readers! I have escaped to one of my local Starbucks so I could get some work done, and I am so eager to get this post up! I truly am a goth girl at heart, and I have loved Edgar Allan Poe's writing for as long as I could remember. 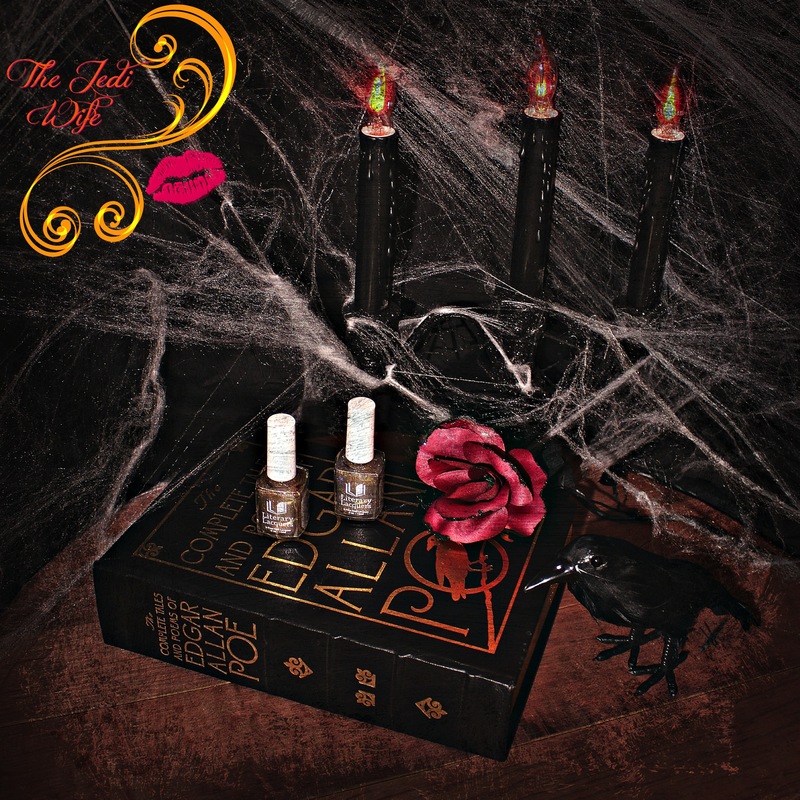 Needless to say, I was ecstatic when the lovely Amy Milder of Literary Lacquers collaborated with Jen Carter from xoxojen.com to create the beautiful shade Soul Within Me Burning, inspired by The Raven, for the inaugural purple-hued Color Box released this past April. As if that wasn't fantastic enough, Amy and Jen have worked together to round out their The Raven-inspired creation by adding two new shades to the lineup! It certainly makes my dark little heart happy, at least as happy as a goth heart can be! Let's check out the two new shades! 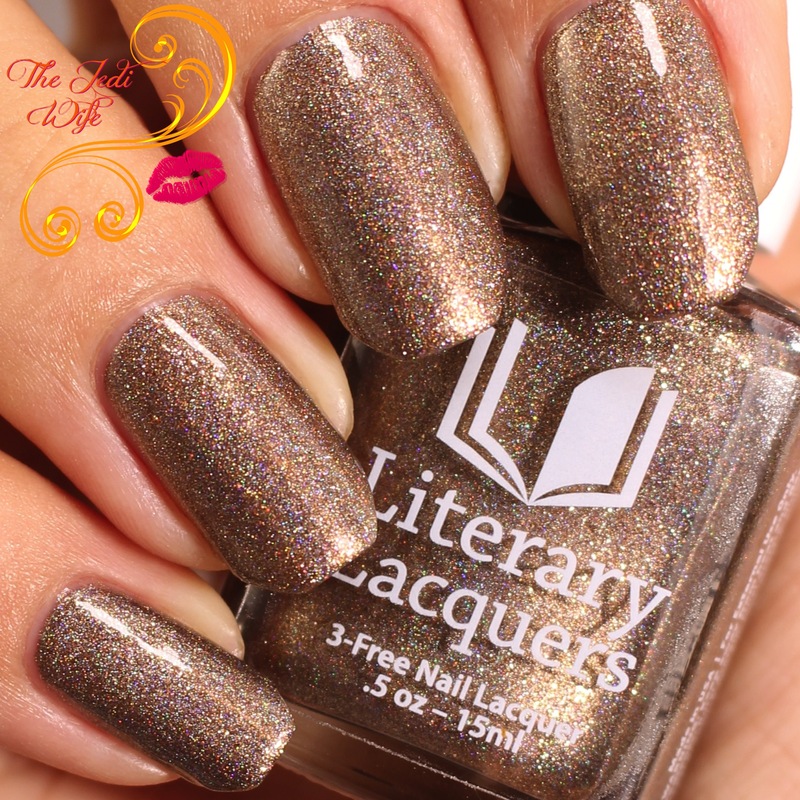 A bronze metallic linear holo with just a touch of grunge. There is no actual direct quote to "sweet Lenore" in The Raven, but she is mentioned with such fondness numerous times throughout the poem. After all, one that is so rare and to be named by angels must be sweet, right? While I cannot speak of Lenore herself, I certainly can say that the formula of this beauty feels like it was made by angels! It is richly pigmented so that you might be able to get away with a single coat, but it still applies like a dream. I almost got away with a single coat myself if it weren't for the bright lights around me! 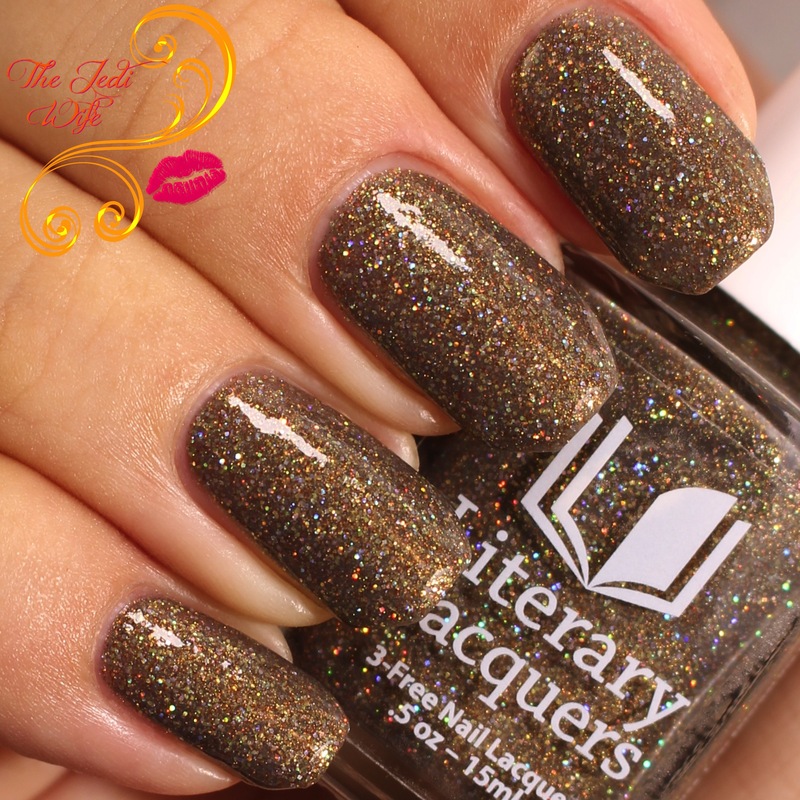 A smoky grey crelly packed with holographic copper and orange holographic microglitter and shimmer. And This Mystery Explore is such a unique polish; I've never seen anything quite like it. I found myself staring at it while it was on my nails, and I really enjoyed this combination! Of course the fact that there is copper and orange in it might have a little something to do with that, ha! It applied really nicely for me, and even with all the glitters, the finish is quite smooth on its own even before adding top coat. While these shades are certainly different, there were some overall similarities in the colour, especially when you look at the bottles. Here I have worn both shades together so you can easily see how they compare to each other. Sweet Lenore is on my pinky and ring finger on the left and And This Mystery Explore is on my middle and index fingers on the right. My poor raven has disappeared and could not be found anywhere so this little crow became my honorary raven for this post. 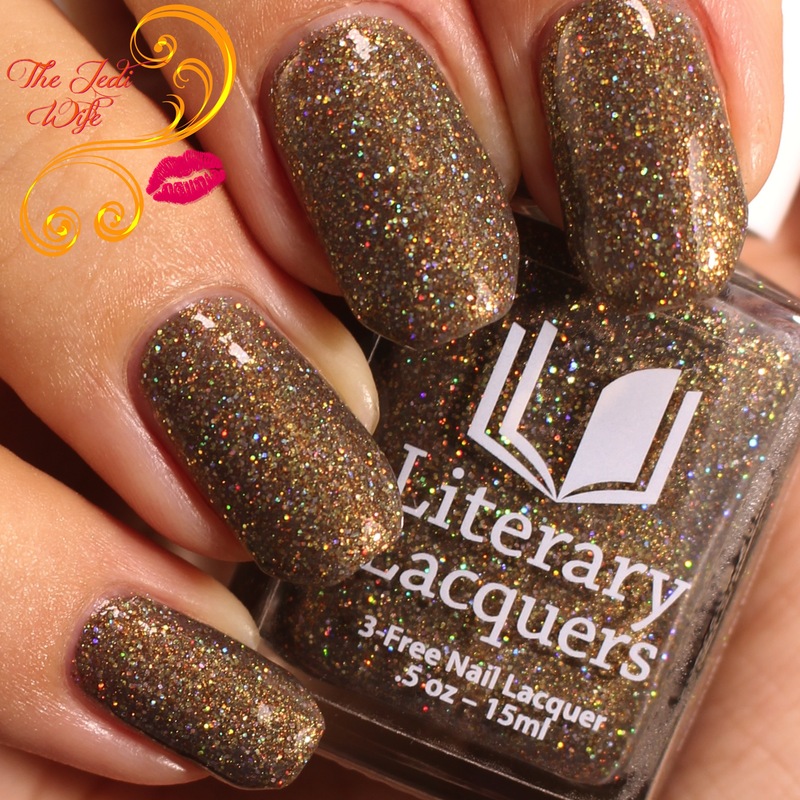 The two new shades will be launching on the Literary Lacquers Etsy shop located here October 17th at noon Mountain time. In case you aren't watching the calendar, that's tomorrow, dear readers! Sweet Lenore will retail for $12 and And This Mystery Explore will retail for $10. Even though it has already been released and currently available for purchase, Soul Within Me Burning, the purple shade from the Color Box and also inspired by The Raven, will be bundled together with these two new shades as a trio for the discounted price of $32.50. What do you think of the two new shades inspired by The Raven? Do you already have Soul Within Me Burning to add to or will you be picking up the trio? What other Poe works do you hope to see Amy use as inspiration in the future? I'd love to hear from you! Until next time dear readers, have a wonderful night! I'm kinda digging the new nail shape. OMG, they're both stunning! 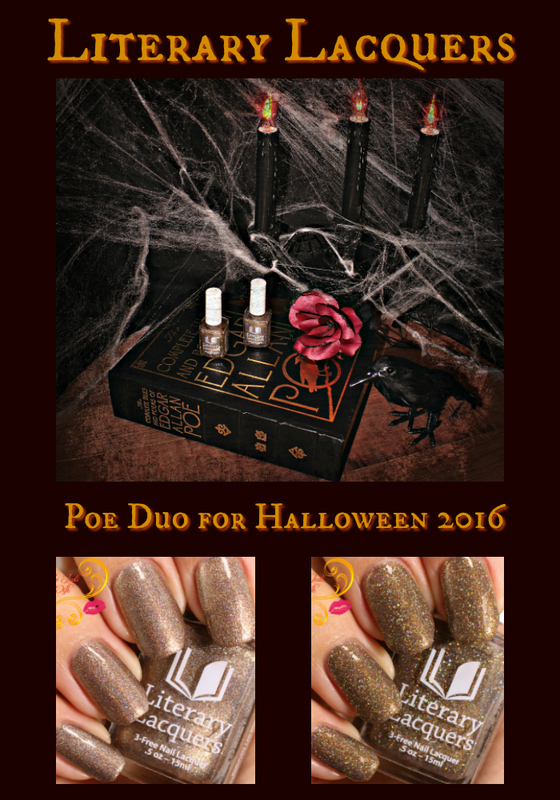 I don't own any bronze polishes so Sweet Lenore is calling my name! I love brown and bronze colors. Both of these are gorgeous! Great inspiration and I love your photos! Spook-tacular! I picked these up today! Both of these shades look so gorgeous! I love your props for the photos too btw.